The EnviroInsite form reports require that sample interval depths and elevations be associated with all measured data. The sample interval depths may be drawn from the START_DEPTH and END_DEPTH fields of the DT_SAMPLE table or DT_WELL_SEGMENT table. The data source depends on the value of DT_SAMPLE.MATRIX, whether DT_WELL_SEGMENT has been populated, and the value of RT_WELL_SEGMENT_TYPE.IS_SCREEN_YN. The following image illustrates the logic to determine whether interval depth values are to be drawn from either the DT_WELL_SEGMENT table or DT_SAMPLE table. 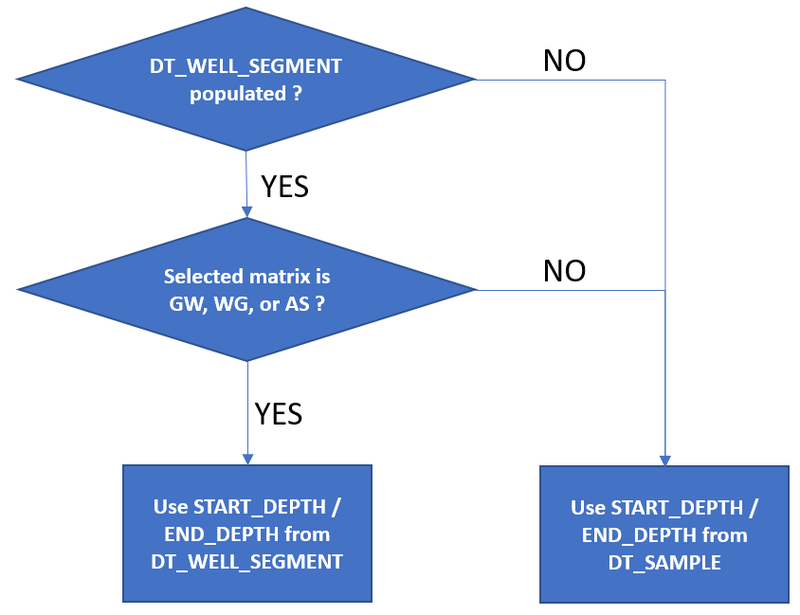 Records containing sample interval data within the DT_WELL_SEGMENT table will be determined based on the value of DT_WELL_SEGMENT.SEGMENT_TYPE and the value of the associated record in the RT_WELL_SEGMENT_TYPE table. The DT_WELL_SEGMENT records containing a SEGMENT_TYPE value for which RT_WELL_SEGMENT_TYPE.IS_SCREEN_YN has been set to “Y” will be presumed to contain a sample interval. 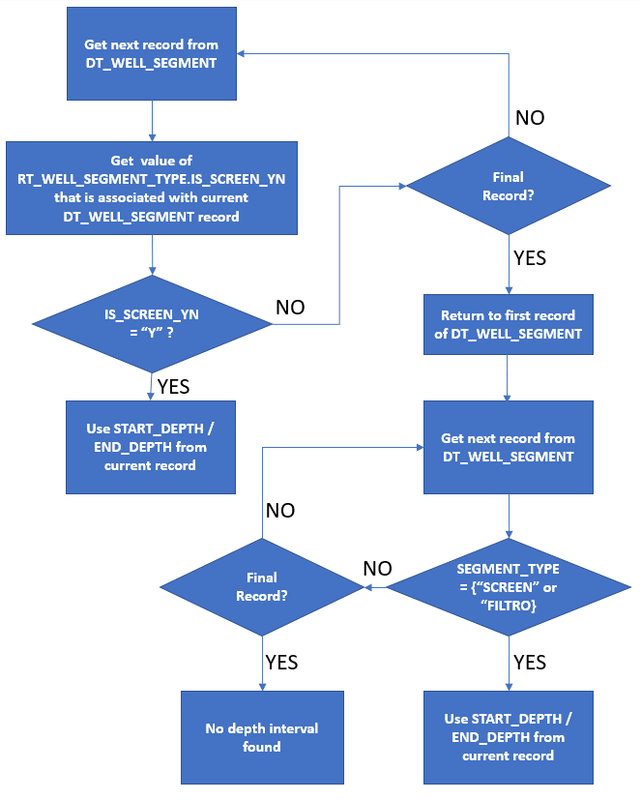 If a “N” value is assigned in any record of RT_WELL_SEGMENT_TYPE.IS_SCREEN_YN, then DT_WELL_SEGMENT records with a SEGMENT_TYPE value of “SCREEN” or “FILTRO” will be assumed to contain a sample interval. The figure below illustrates the described logic for finding the depth interval from the DT_WELL_SEGMENT table.